Splitting twin lobsters at Causeway. 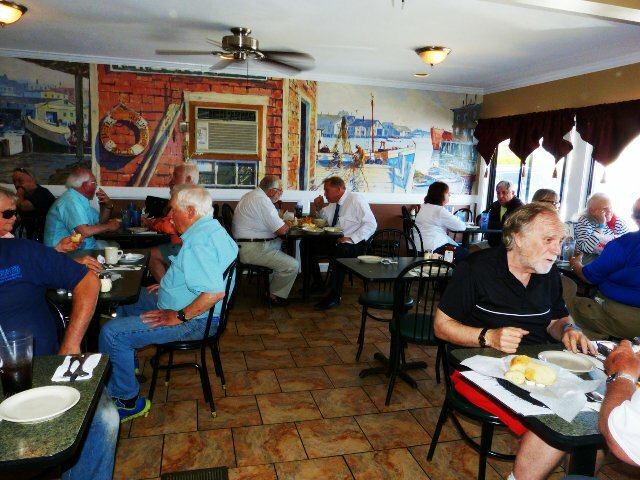 Cateplans the Monday special at Azorean. Returning on Tuesday for tapas. The room tends to the cacaphanous. 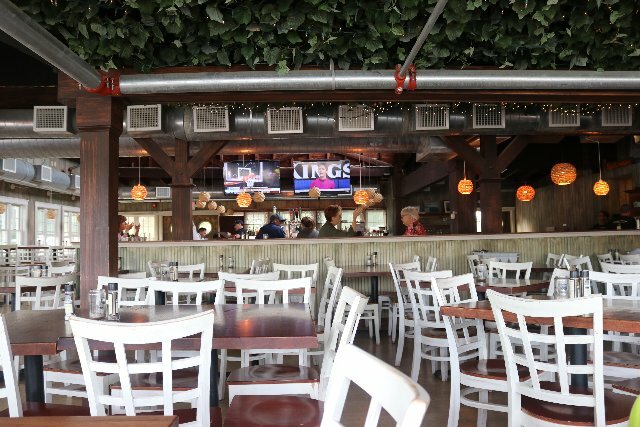 The somewhat more comfortable interior of Charlie's. 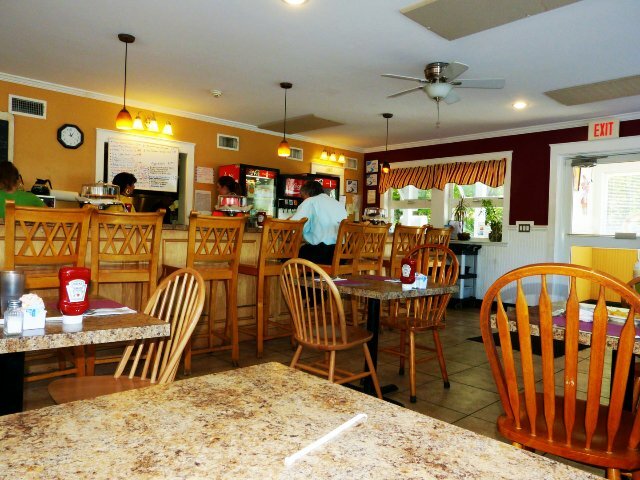 Where locals enjoy a hearty breakfast. Stuffed croissants with a side of hash. She took this celebration photo of me. 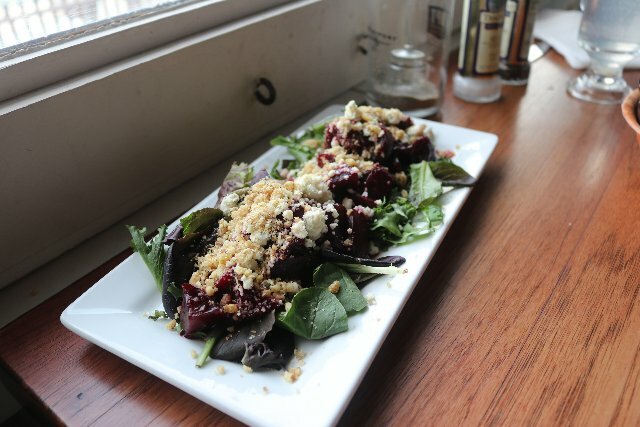 I had the beet salad. She tried tomato and cheese with balsamic dressing. What was left of my paella. 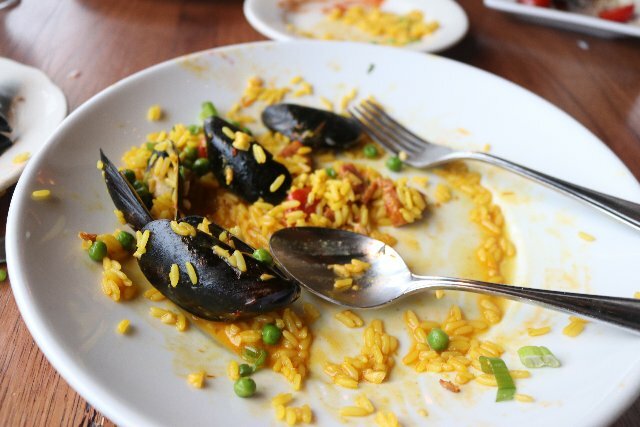 Generous serving of saffron rice and seafood. 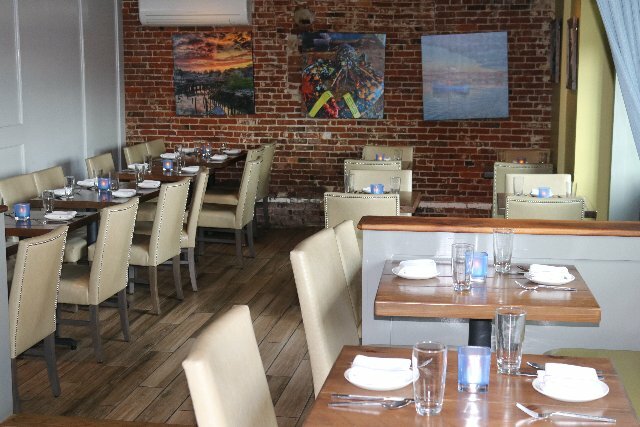 The upscale decor of Tonno. Astrid had a salad with cheese. The squid ink pasta and tuna special was a mess. A disappointingly bland vegetable plate. The landmark Nichols just before the bridge to the rotary. 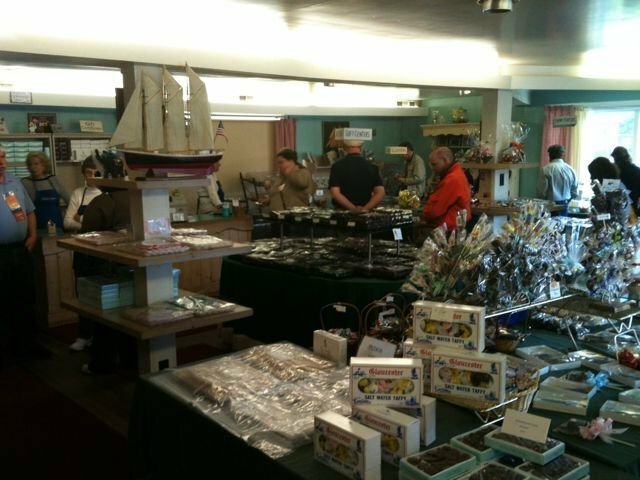 Tables of hand made candy to select from. 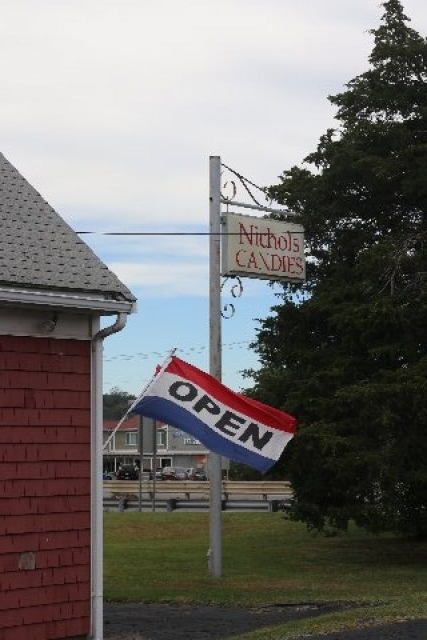 During our annual visit to Cape Ann to visit family and friends we try to arrive on Monday. We checked into a new venue for us Wingaersheak Inn on the mainland side just a hop from the bridge and traffic circle. It proved to be a cozy and convenient nest from which to quickly access Gloucester. On our first full day we visited gorgeous Wingaersheak Beach. The downside was our only day of rain and foggy mist. That meant a brief but moody and atmospheric stroll looking across the Annisquam River toward Lighthouse Beach. We returned later in the week when conditions were less daunting. Getting settled meant being on time for Monday night specials at Azorean. 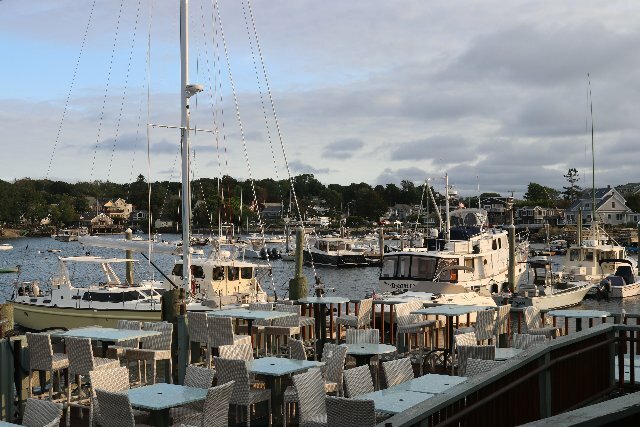 Over time it has become our favorite restaurant on Cape Ann. It has the terrific combo of quality and price. 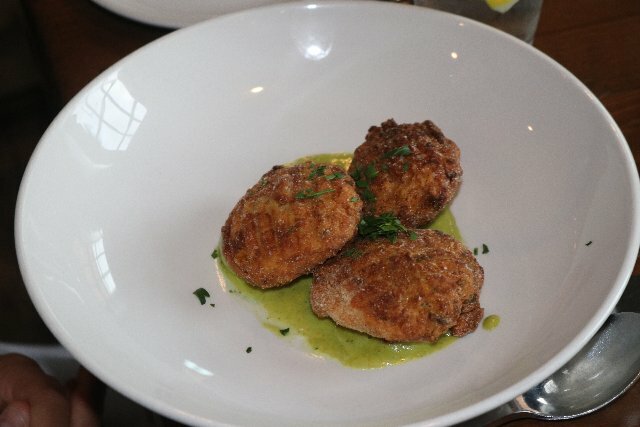 The Monday menu features cataplanas for just $12.95. It is served in a round pot with hinged lid. This allows for remaining hot while spooning out its abundance of seafood, chicken, sausage, rice and other ingredients in a wonderful, savory broth. 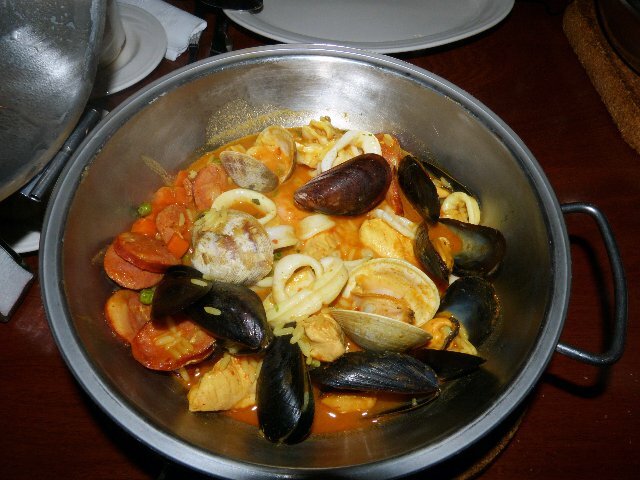 The dish compares to bouillabaisse or a wet paella. This time, of several options, I chose seafood and Astrid had the Spanish version which included chicken and sausage. A year ago I was part of a press wine tour of Portugal extended with a final weekend in Porto. We sampled wine from dawn to dusk for several days touring Portugal's vineyards by bus and plane. There were many gourmet meals served by celebrity chefs. 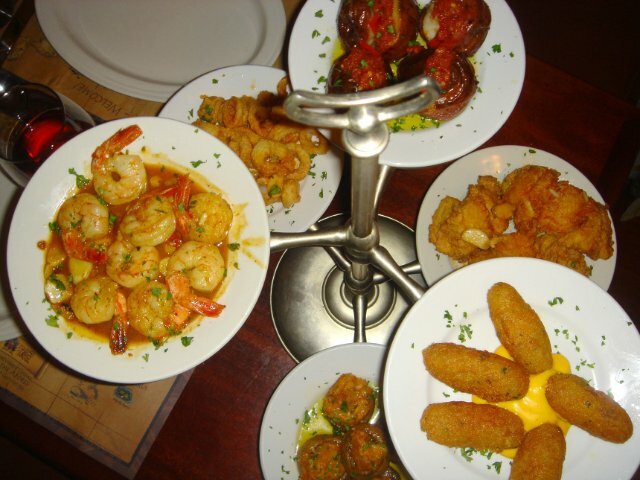 But, truth is, nothing topped what we have enjoyed at Azorean. While the chefs had largely deconstructed traditional recipes the Gloucester restaurant sticks to family style cuisine. 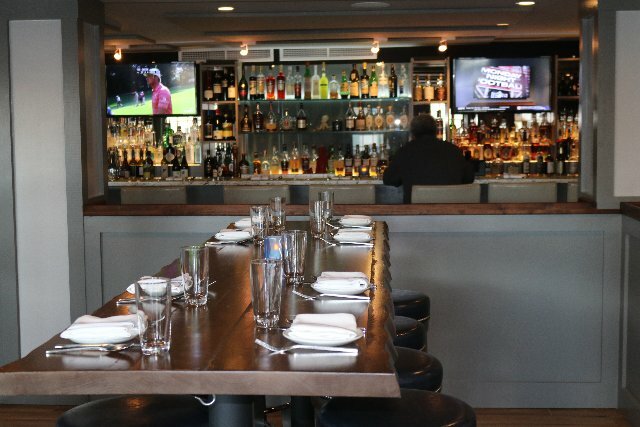 There is an extensive wine list with house wine at $6 a glass then options at $8 and a special for $9. I went for the top shelf and it brought me back to the best of what I had experienced of exceptional Portuguese vintages. It is a clear, crisp, fruity white wine and I savored every sip. On Tuesday night we returned to meet our friends Harry and Mary making the trip from Beverly. We introduced them to Azorean a couple of years ago. The date was confused and they arrived a week early. We then connected a week later and since then they have become hooked. Harry told me that when they recently had house guests they took them to the restaurant. On our second night the special was tapas at $5 a plate rather then the usual $8. It came to the table in two trees. The server struggled a bit as the apparatus is weighty. You can spin the plates to sample options. 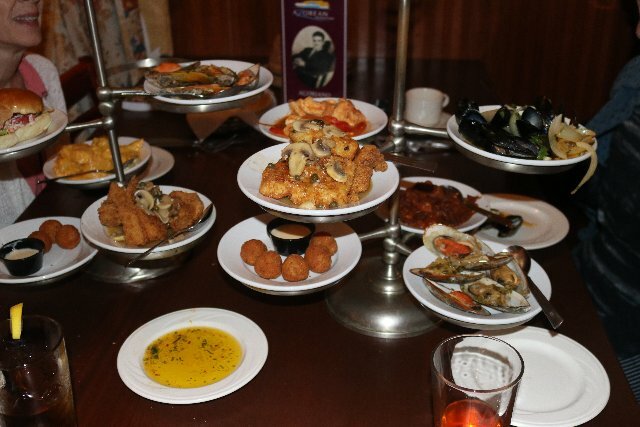 The individual portions are generous and we were able to enjoy a variety of flavors. 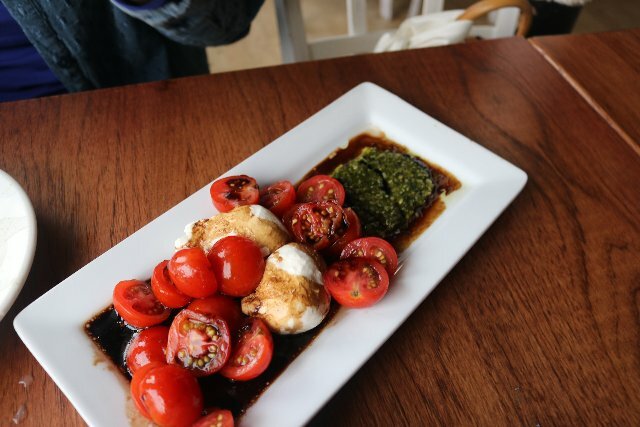 It was a fun chance to enjoy a different menu option and spend time with friends. There are other specials during the week which we hope to try another time. Truth is I would opt for spending every night of the week at Azorean. Our accommodations featured a full kitchen and dining table. That meant breakfast and some lunch options. We always bring basics like tea, coffee, and oatmeal. Then shop locally for supplies. On Tuesday morning, however, other than coffee and tea the cupboard was bare. 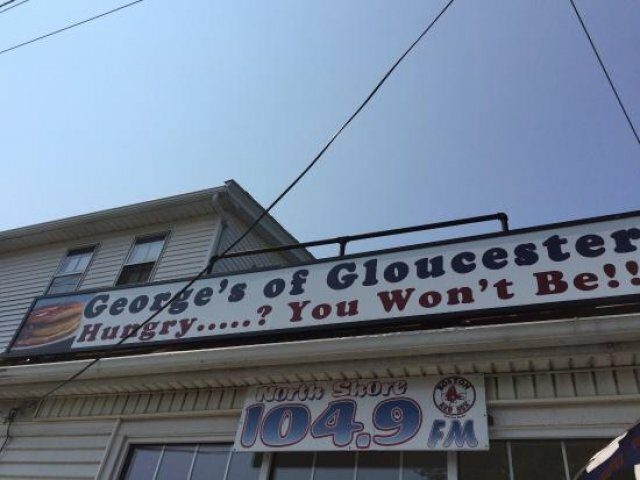 That meant the opportunity to visit famous George’s Coffee Shop (178 Washington St, Gloucester, MA 01930) a local hangout for enormous breakfast and lunch options. It was raining and a bit of a walk from our car. 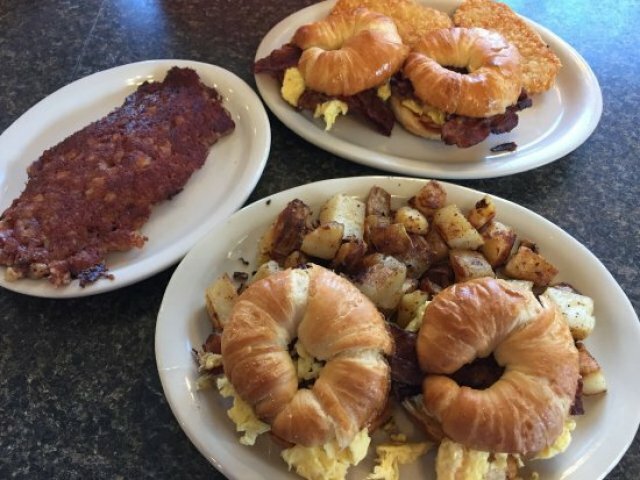 It’s always busy but we managed to find a table and settled in for an enormous breakfast at an affordable price. I went for eggs Benedict over hash. It was enormous and did not disappoint. Astrid had scrambled eggs with a choice of vegetables. It was great fun and we decided to make a return visit, after we packed, departing on our final day. On that occasion I opted for a “normal’ meal of just two scrambled eggs, Canadian bacon, home fries and English muffins. It was more than enough. 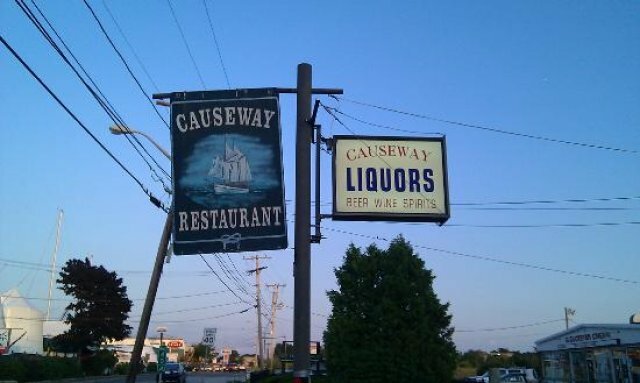 My favorite lunch places are Charlie’s (83 Bass Ave) and Causeway. They are similar featuring seafood and chowder. 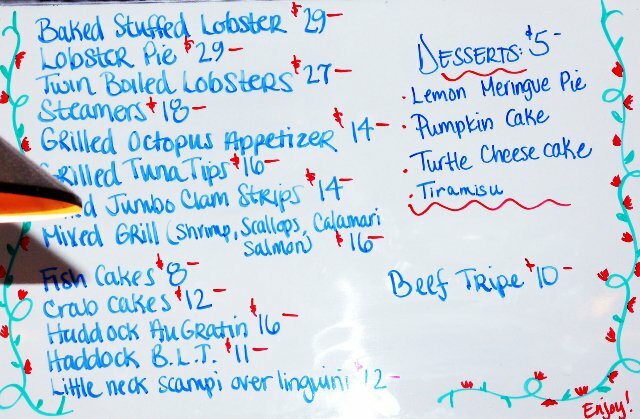 The Causeway menu is more varied and ridiculously abundant. 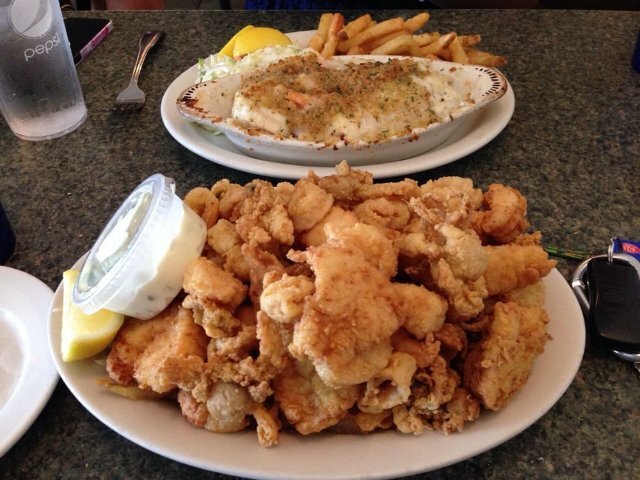 The seafood is so fresh it seems that the fish flip out of the sea and onto the plate. There are long lines for these popular, out of the way venues. The noise level at Causeway is off putting for Astrid. She prefers Charlie’s which we didn’t get to this time. A couple of days I went solo to Causeway as she had other plans to visit friends or to join the Sunday morning drumming group. My sister Pip is a drummer and we had joined the group for a trip to Senegal some years ago. 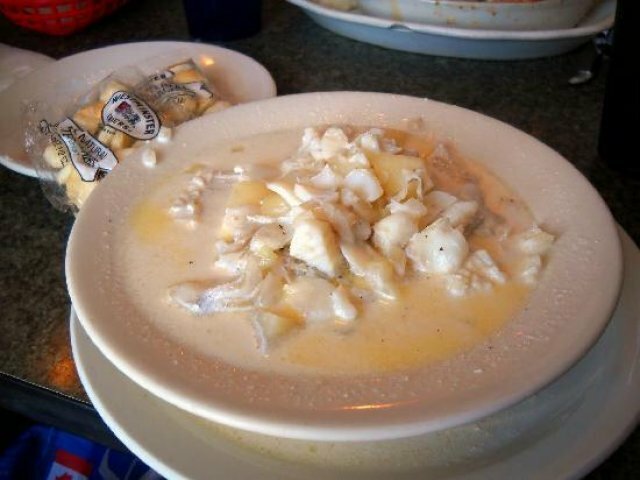 The first time on my own I had the fish chowder. It’s huuuuuge. Solo I was able to skip the line and have lunch at the counter. From that vantage I enjoyed watching food coming out of the busy kitchen. 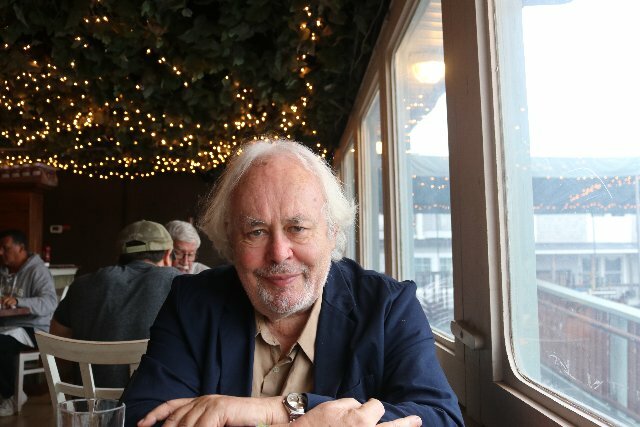 It was before noon on Sunday but the restaurant wasn’t crowded when I sat at a table for an enormous serving of mussels in wine and garlic. In the past I have had the breaded and baked fish which is enough for two if not three diners. Most folks take home at least half of such meals. No visit to Gloucester is complete without lobster but that can be pricey and disappointing depending on season and market price. 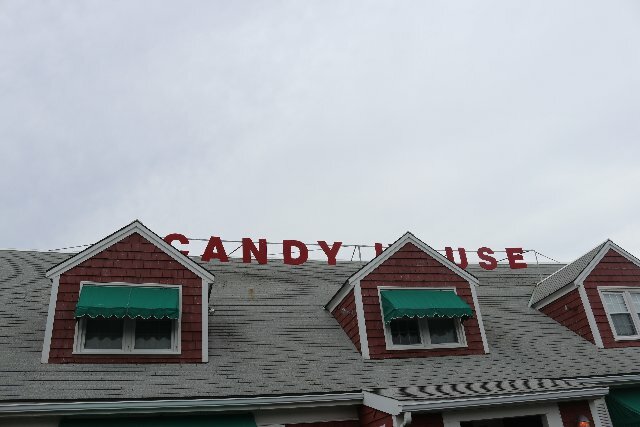 A couple of years ago I had a tough, old and terrible one at Lobsta Land a popular place just out of town on route 128. We haven’t been back. Checking menus the going price for a pound and a quarter crustaceans was $25. 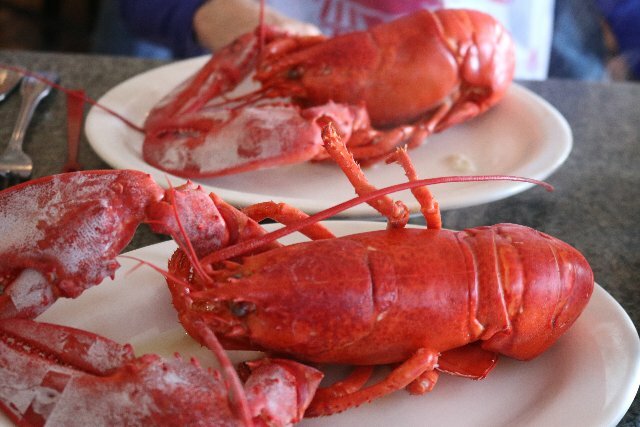 I convinced Astrid to enjoy a lunch at Causeway of twin lobsters for just $27. They were just awesome although the usual cacophony was daunting. Charlie’s has lobster rolls but not boiled lobsters. I got my fix. Wednesday night presented a challenge as it was our anniversary. I called an inn with ocean view we had enjoyed in Rockport. Off season, however, they are only open Thursday through Sunday. We settled on Rocky Neck the artist’s colony that features a couple of restaurants. 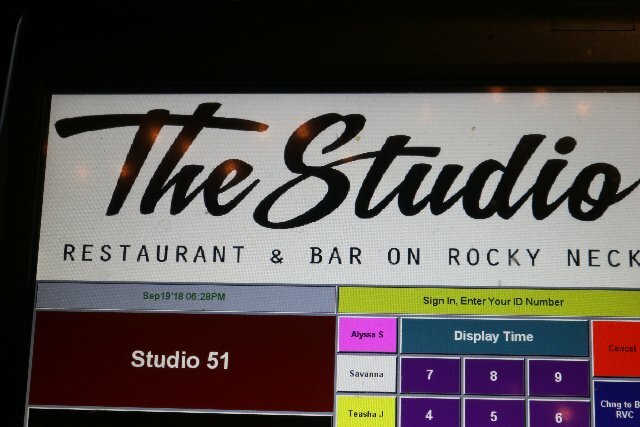 The Rudder was closed for the season but we had better luck with The Studio. 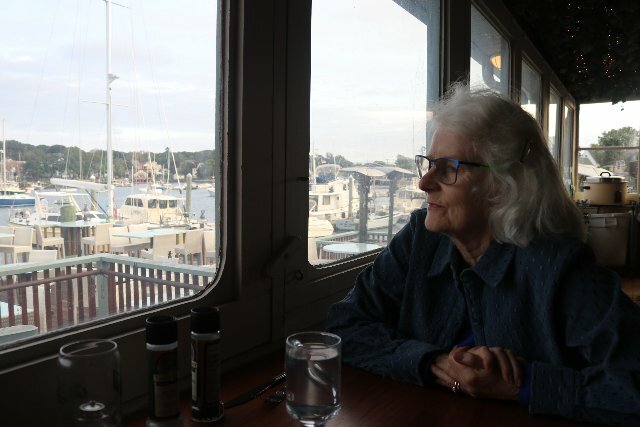 Arriving fairly early, we had been out and about all day, we got a prime table with window and wonderful harbor view. It was too chilly for the deck which we enjoyed on another occasion. Our very gracious waitress informed us that the entire menu was now off season and half price. 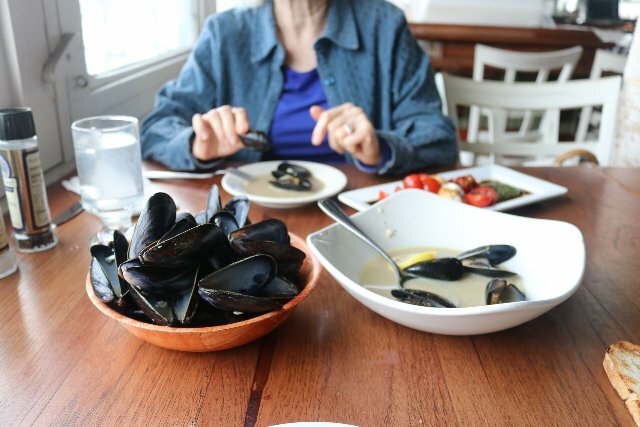 We went all out with salads, mussels as an appetizer, and entrees. 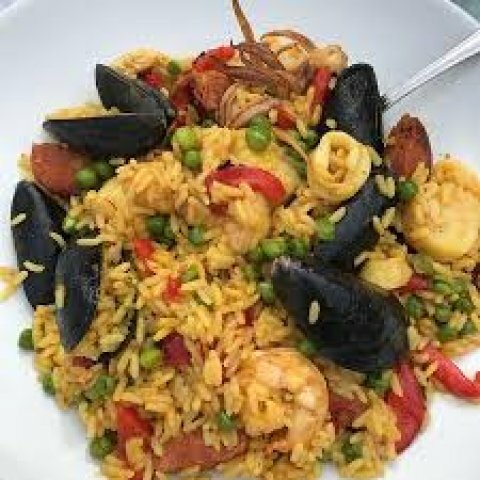 I had the paella and she enjoyed fish. With beverages for a toast the meal topped $100 but was reduced to about $50. We tipped generously for what had been a truly festive celebration. On Thursday we had a date for Gloucester Stage with my sister Pip and niece Sarah. She insisted on hosting us to a relatively new, upscale restaurtant in downtown Gloucester. Tonno was familiar to me as the former Blackburn Tavern in a vintage setting. It was one of Mom’s special occasion destinations. 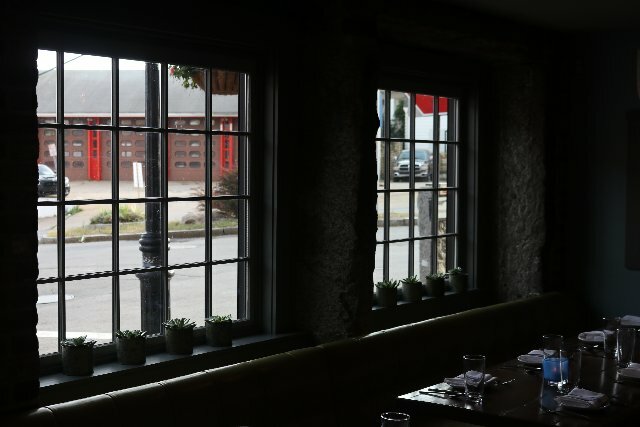 We had sidewalk seating between granite framing windows with a view of the street. Service was less than attentive and adjoining tables proved to be noisy. 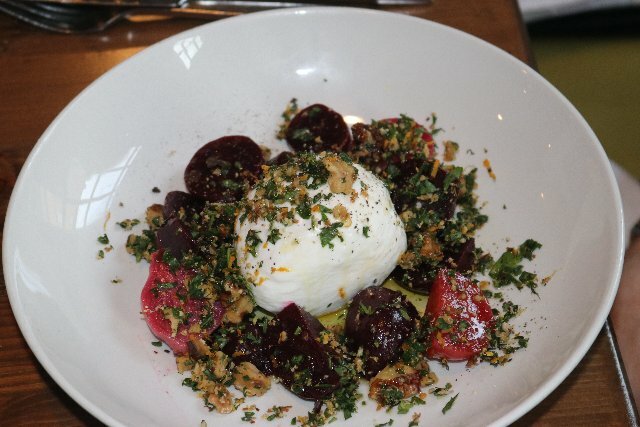 The relatively brief menu reflected the ambition and pretentions of the chef. As did the prices. 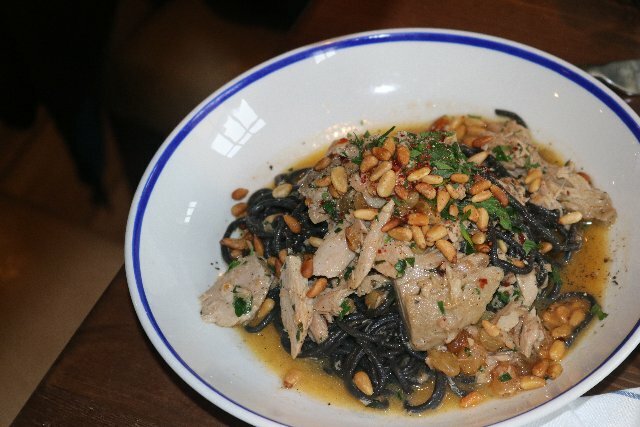 From the daily specials I ordered a dish with black squid pasta topped with smoked tuna, pine nuts and other ingredients at about $25. Simply put what was served proved to be an ungodly mess. The presentation was a monochrome and the interesting pasta was smothered under less than appealing ingredients. Tonno in Italian means tuna and that raised expectations. What was served however seemed like it came from a can. I pushed it aside and tried to find the pasta. When Pip asked, trying to be polite, I said that it was “challenging.” Astrid asked for hot water with lemon and was told it was not possible. The espresso machine is not set up for that. Hoping to stay alert during theatre I ordered cappuccino. What came to me was a cup of foamed milk with barely a trace of coffee. Cripes, they couldn’t even get that right. Pip is a vegetarian and that always represents a challenge. Upscale restaurants and chefs are notable for making an effort. 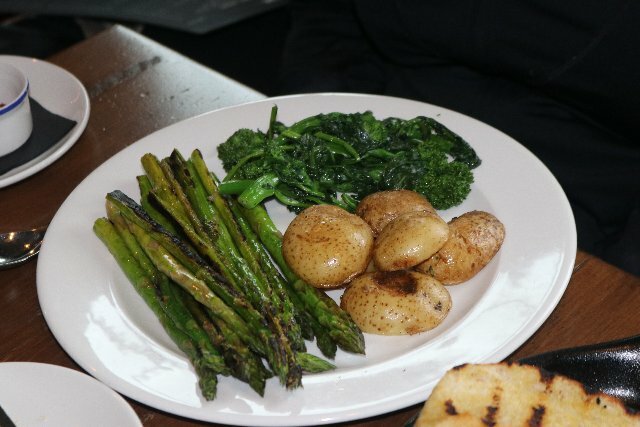 In this case she was charged a la carte prices for a bland plate of small potatoes, asparagus and spinach. Clearly Tonno's ambition and pretention did not come close to matching price. On another night we returned to the always fun, main drag Mexican restaurant Jalapenos (85 Main Street). It was affordable and tasty. I took home half of my dinner of enchiladas with a delicious mole sauce. On Saturday we attended the opening of Jay Jaroslav at Trident Gallery. The town was busy and parking was challenging. 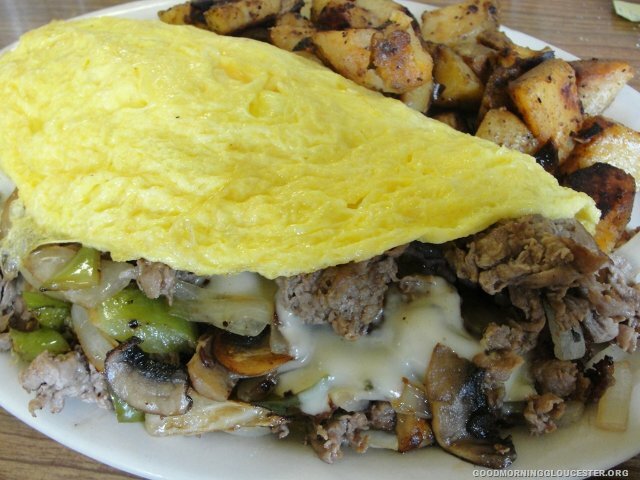 After a spin about we settled on tried and true, but nothing special, Topside Grill. It’s across the street from the tourist trap Gloucester House and about half the price. During a busy weekend, however, there is no waiting for a table. 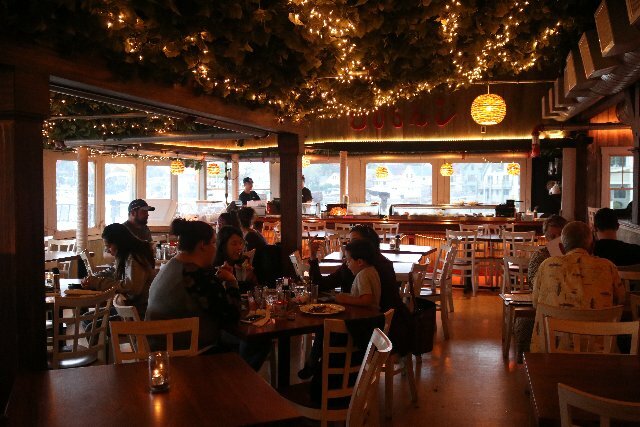 Service was attentive but the feeling of the restaurant is old and generic. It needs a makeover to stay competitive. Our meals were at best adequate. During the week there are specials worth checking. Sunday night Pip went all out with a great family dinner. 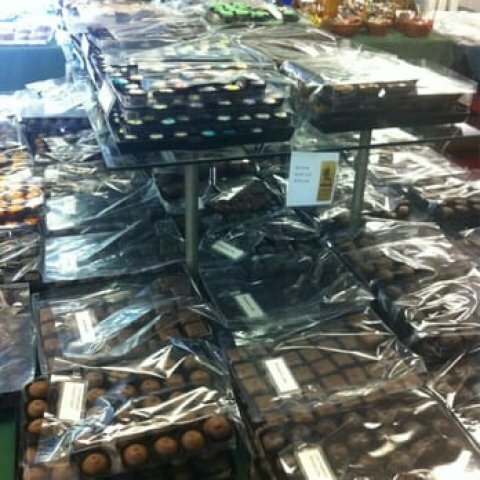 We brought her an assorted box of chocolates from the fabulous Nichols. It’s at the end of 128 just before the bridge into town. We got a box to enjoy back home. It takes great discipline to have just one piece each night for as long as the box lasts. We both selected our favorites from tables of home made treats. It’s an oh so sweet reminder of a fabulous week of Gloucester dining. Sadly, there’s nothing like it back home in the Berkshires.